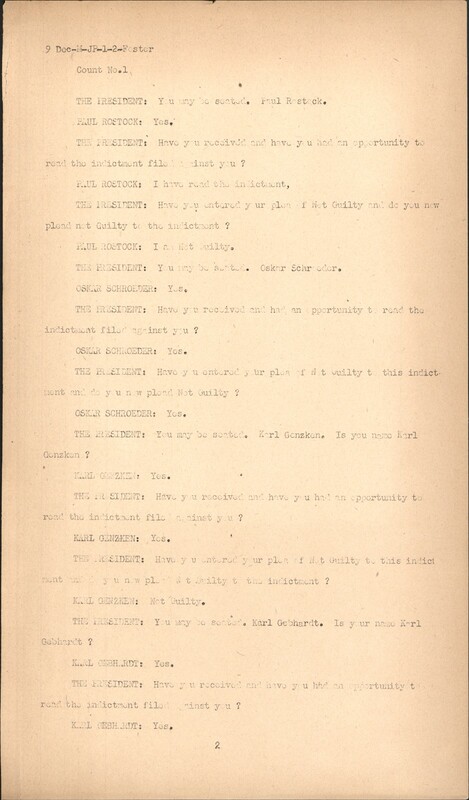 This is the trial transcript for the first of the Nuremberg Trials. 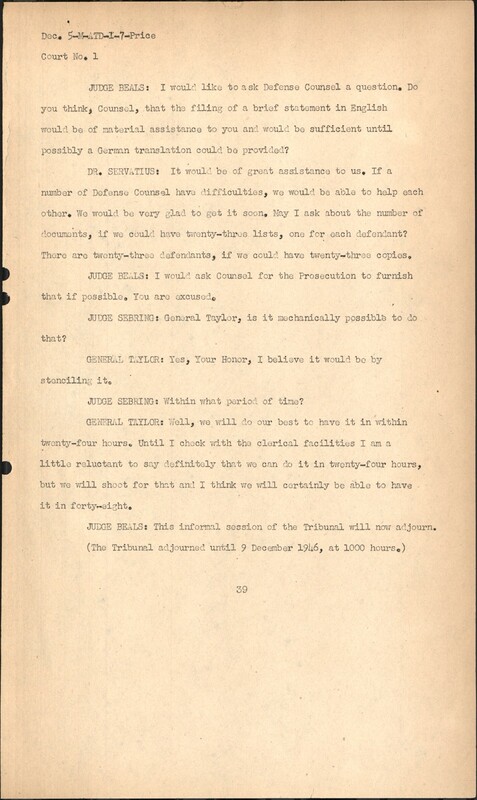 This is a corrected copy of transcript for 5 December 1946. Please destroy your old copies Official Transcript of the American Military Tribunal in the matter of the United States of America, against Karl Brandt, et al, defendants, sitting at Nurnberg, Germany, on 5 December 1946, 1015-1200 hours, Justice Beal presiding. THE PRESIDENT: Members of Military Tribunal No. 1 meet this morning informally in chambers to hear arguments upon the motion of certain defense counsel for a continuance of case No. 1 pending before the Tribunal. Counsel will be allowed thirty minutes, on each side, to present their arguments. Two counsels for the defendants may argue upon the motion. The defense counsel will open and close the arguments, and the defendants may divide their thirty minutes between the opening and closing as they please. You may proceed with the arguments upon the motion. DR. SERVATIUS: The counsel here for the defendants presents an application for the postponement of the beginning of the trial. They are the counsel who happened to be present at the time, who drew up the application, and I am convinced that most of my colleagues who are not present also approve. There are technical reasons which lead to this application. It is the concern which we have as defense counsel that our witnesses cannot be here in time since we are not able to make our application soon enough to have the witnesses brought here. The reason for this is that the material which can give us occasion to call a witness has not been in our hands long enough so that we can work on it. Only on Saturday afternoon were documents available, and others came in the next few days. For many of the defense counsel it is not possible with these few documents, in a short time, to speak to all of the defendants. Especially we still lack a list of the documents so that we can be able to select which documents are significant for each individual. Therefore, we have to look into the documents themselves to determine which are important; this takes hours. During this time other defense counsel, of course, cannot obtain information about these documents. In my application I stated the consequences of this condition. In order to get a witness here we would need several weeks. I as defense counsel for the first defendant must expect to have my witnesses called to the stand here first. General Taylor has been kind enough to say that he assumes that the prosecution's case will take two or three weeks. That would mean, if one includes the Christmas recess, that I must be ready by the beginning of January. According to the experience in the previous trial it will hardly be possible to get my witnesses here in that time since I do not know where some of them are. There is the same difficulty with the experts. They would have to be here from the beginning of the trial. Whoever is inclined to appear as an expert and who is possible as an expert for the individual case must be discussed carefully. The court is supposed to be represented by the experts; the same goes for the witnesses. I do not want to call witnesses who will prove to be useless. It is my endeavor through sworn statements to replace the testimony of a number of witnesses and shorten the proceedings. That took a great deal of time in the previous trial; as far as I recall it took an average of two months until a sworn statement was available here. Then I cannot make my application yet, it will be unavoidable. In January there will be a period after the prosecution has finished its case -- that is, there would be an interruption which should be avoided not only in the interest of the defense but in the interest of all. This interruption would be better at the beginning. I ask for three weeks, considering the possible one week Christmas holiday, that would in effect be two weeks. 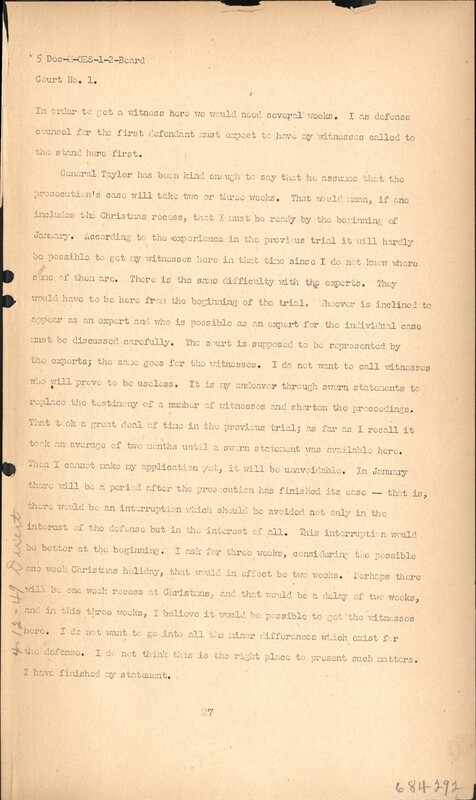 Perhaps there will be one week recess at Christmas, and that would be a delay of two weeks, and in this three weeks, I believe it would be possible to get the witnesses here. I do not want to go into all the minor differences which exist for the defense. I do not think this is the right place to present such matters. I have finished my statement. THE PRESIDENT: Counsel for the prosecution. GENERAL TAYLOR: The prosecution believes that this motion is entirely without foundation -- without legitimate foundation. One of the principal points which appears to be made here is that some one-hundred documents have been made available to the defense and that an additional 150 have not been made available. This motion was written December 3rd and was received by me yesterday afternoon. I checked with the document room and the Defendants' Information Center the moment I received this and was told that some 240 documents were already in the Defendants' Information Center. I am told that there is a list of 296 documents which has been furnished to the Defendants' Information Center. It appears, therefore, there was some 50 missing so we put a special staff on last night and after this morning 284 documents are in the Defendants' Information Center. So far as I know there is no rule or requirement that we furnish these documents. We are indeed bound by custom here to give them all documents 24 hours in advance of their use. They have received these documents nearly a week in advance of the trial and it is just a privilege which we extend because we are in a position to do so and think it will assist the trial and is a matter for the rights of the defendants. It is discouraging to see our attempt to extend this privilege as extensively as we can, carried into an attempt to put the trial off. 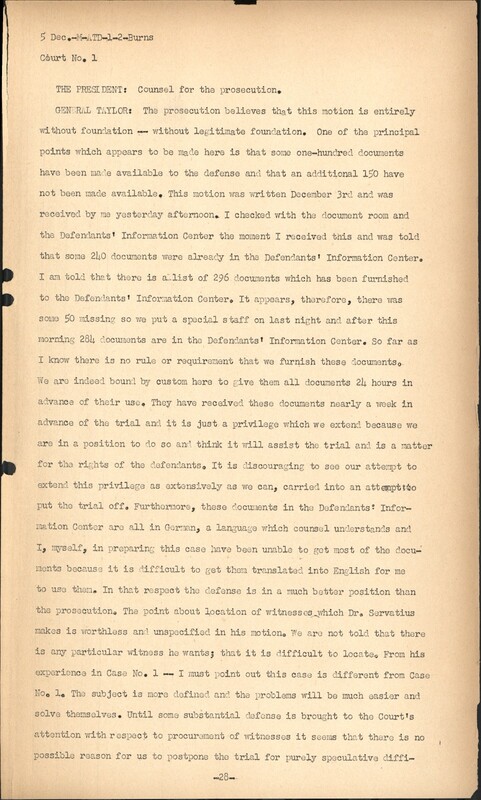 Furthermore, these documents in the Defendants' Information Center are all in German, a language which counsel understands and I, myself, in preparing this case have been unable to get most of the documents because it is difficult to get them translated into English for me to use then. In that respect the defense is in a much better position than the prosecution. The point about location of witnesses which Dr. Servatius makes is worthless and unspecified in his motion. We are not told that there is any particular witness he wants; that it is difficult to locate. From his experience in Case No. 1 -- I must point out this case is different from Case No. 1. The subject is more defined and the problems will be much easier and solve themselves. Until some substantial defense is brought to the Court's attention with respect to procurement of witnesses it seems that there is no possible reason for us to postpone the trial for purely speculative diffi culties. The same, I think, applies to the question of experts which the defense has raised. It does seem, and surely they have had time to lood into that matter fully. The Indictment gives them the information as to what kind of expert they want to have here and if they have difficulty in getting him here by December 9th a transcript will be served and inform the expert of what was going on. It seems to us there has been sufficient time for them to get experts. Some point is made this motion about the rooms which have been furnished. We have done our best on that. Certain rooms were made available to Defense Counsel, and they found them unsatisfactory. As a result of their request, other rooms which are better have been made available as of yesterday and are set up, and working conditions are possible there. As far as typewriters are concerned, it is difficult to procure German typewriters. We are today putting into this room a selection of English and German typewriters and are doing all we can to aid Counsel to perform their duties. In many respects, because of the language situation in this trial, I think their difficulties are no greater than our own on the Prosecution side. I must finally point out that a postponement of this trial means a postponement of other trials which are to follow this one. Under Ordinance Number 7, this is a continuing program, and if this trial does not start as scheduled, it will result in postponement of those which are to follow. I think that is all I have to say, Your Honor. THE TRIBUNAL (Judge Sebring): General Taylor, are you in a position to say now how many documents will be used in the prosecution in its case in chief? GENERAL TAYLOR: In its case in chief? It will come very close to the figure 300, Your Honor. I think Mr. McHaney can answer that question in more detail than I can. 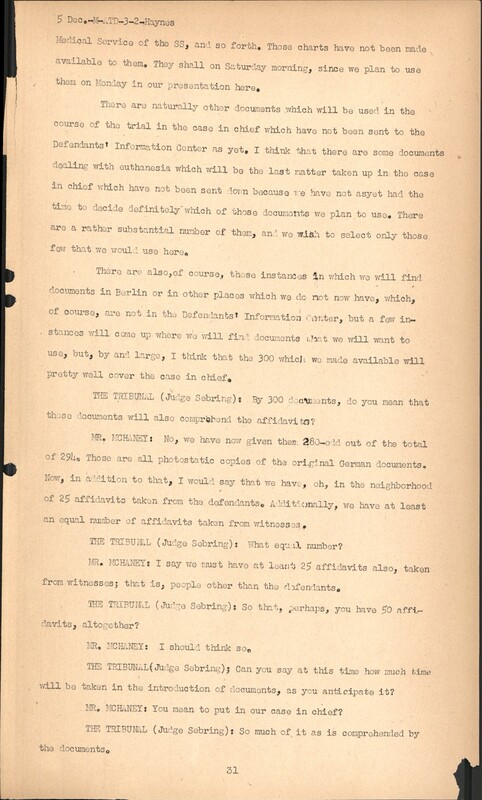 Firstly, we have obtained a rather substantial number of affidavits from certain of the defendants. Those documents have not been made available in the Defendant's Information Center, and we do not plan to make them available until approximately 24 hours prior to the time that they will be used in court. In the same category falls a number of charts showing the organization of various offices with which the Court will be dealing, such as the Medical Service of the Luftwaffe, the Medical Service of the Wehrmacht, the Medical Service of the SS, and so forth. Those charts have not been made available to them. They shall on Saturday morning, since we plan to use them on Monday in our presentation here. There are naturally other documents which will be used in the course of the trial in the case in chief which have not been sent to the Defendants' Information Center as yet. I think that there are some documents dealing with euthanesia which will be the last matter taken up in the case in chief which have not been sent down because we have not as yet had the time to decide definitely which of those documents we plan to use. There are a rather substantial number of them, and we wish to select only those few that we would use here. 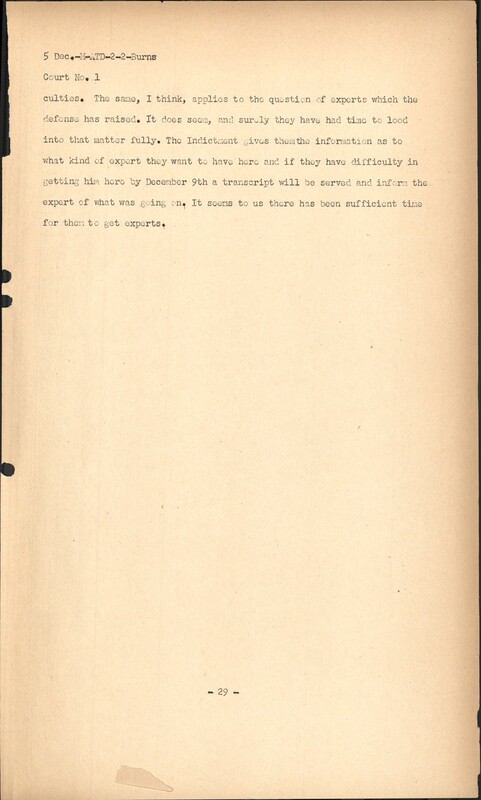 There are also, of course, those instances in which we will find documents in Berlin or in other places which we do not now have, which, of course, are not in the Defendants' Information Center, but a few instances will come up where we will find documents that we will want to use, but, by and large, I think that the 300 which we made available will pretty well cover the case in chief. THE TRIBUNAL (Judge Sebring): By 300 documents, do you mean that those documents will also comprehend the affidavits? MR. MCHANEY: No, we have now given them 280-odd out of the total of 294. Those are all photostatic copies of the original German documents. Now, in addition to that, I would say that we have, oh, in the neighborhood of 25 affidavits taken from the defendants. Additionally, we have at least an equal number of affidavits taken from witnesses. THE TRIBUNAL (Judge Sebring): What equal number? MR. MCHANEY: I say we must have at least 25 affidavits also, taken from witnesses; that is, people other than the defendants. THE TRIBUNAL (Judge Sebring): So that, perhaps, you have 50 affidavits, altogether? MR. MCHANEY: I should think so. THE TRIBUNAL (Judge Sebring); Can you say at this time how much time will be taken in the introduction of documents, as you anticipate it? MR. MCHANEY: You mean to put in our case in chief? THE TRIBUNAL (Judge Sebring): So much of it as is comprehended by the documents. MR. MCHANEY: Well, that is difficult to say. The manner in which we will present the case is more or less on a topical basis, in accordance with the order that we have set up in the Indictment. In other words, after the opening statement and certain procedural matters are taken care of, we will start introducing documentary evidence consisting of affidavits by the defendants and German documents on the high altitude experiments. More or less at the conclusion of the introduction of documentary evidence on that topic, we will call certain witnesses to the stand to testify with respect to these matters. We will than proceed to the next experiment, which is the freezing experiment. In the high altitude experiment we have, roughly, 40 or 45 documents dealing with that matter. As far as I recall, we have only two witnesses. I should think that it would probably take us in excess of a day to put in those documents. Of course, the examination of witnesses may prove to be a rather time-consuming matter because there are quite a number of Defense Counsel here, and roughly half of them, I think, are charged with the high altitude experiments, and I assume that there will be considerable cross examination. THE PRESIDENTS: Defense Counsel may proceed with the closing argument. Twenty-two minutes remain. DR. SERVATIUS: I wanted to reply quite briefly to the argument made by General Taylor. It is a matter cf course that as far as the claim is concerned, we have none for the presentation of such documents. In practice, the situation is different. It is such that during the proceedings we will have to make our applications. I must be in a position to present my evidence, and the sooner the Prosecution gives me those documents, the sooner I shall be ready. The purpose is merely to avoid an interruption of the proceedings, and I don't want to come in with continuous motions during the proceedings. It would be better if we could postpone the proceedings in the beginning so as to be able to go ahead afterwards. As for as the practical use of the documents is concerned, I should like to point cut that there is no list of documents so that, in practice, this pile of documents is of no use to me. I should have to look through each individual document in order to ascertain what it contains, and everybody else would have to do the same, so I should like to ask the Tribunal to convince themselves just how difficult it will be to carry this out in practice. In practice, we do not have the documents in our hands, and we can not use them. If we had a list, we could have shared them out, and each Defense Counsel could have had 20 documents copied, which we would have had at our disposals. I am convinced that the Prosecution is doing everything to help us, but the situation is that even this morning we do not have a room in which to work. In practice, we are short the documents, we are short of the typewriters. I did not want to put this to the Tribunal because I did not think that this was a suitable place, but that is the situation. We do not have the things. I should like to put the emphasis on the pertinent difficulties: namely, that witnesses and experts can not be brought here in practice in time, and the postponement which I am requesting is in practice no more than a fortnight's delay. It would be to everybody's benefit, as subsequently we would be able to go ahead with the proceedings at a greater speed, whereas, these are practical questions which can not be overlooked. THE TRIBUNAL (Judge-Sebring): May I ask Counsel a question, please? I note that in your motion for a continuance, you say that it is necessary to have expert witnesses present during the entire course of the Prosecution's case in chief. Can you tell me what there is in the Prosecution's case that would require the presence of your expert witnesses throughout that phase of the Prosecution? DR. SERVATIUS: According to German legal procedure, the expert ought to be present during the entire proceedings, and the expert, in particular, ought to be in a position to judge from his own expert knowledge what the implication is and what the accusations are. During the proceedings documents, too, will be presented and also witnesses will be appearing, and the expert will certainly have questions to put to the witnesses -- probably very relevant and important ones. It is for that reason that it would be suitable, in my opinion, and also in accordance with German law if the expert were here in good time, but, then, in particular, it would be difficult to obtain a suitable export in time. THE TRIBUNAL (Judge Sebring): You have merely said in your motion that you intend to produce certain witnesses -- an expert to what facts or phase of knowledge? 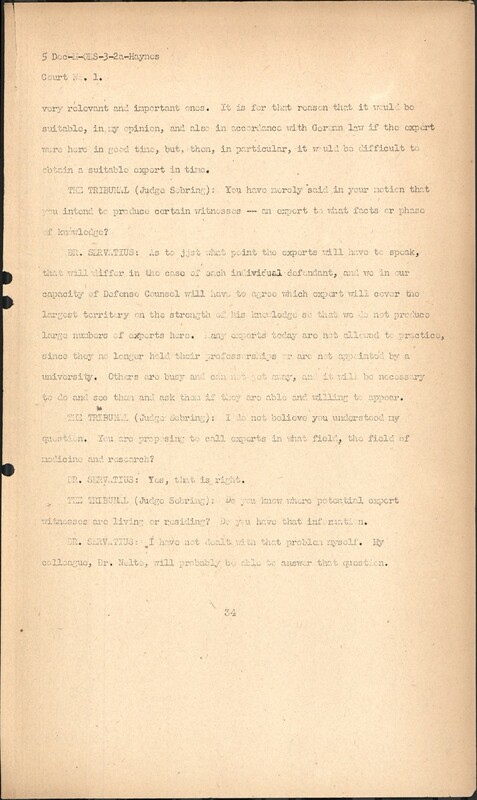 DR. SERVATIUS: As to just what point the experts will have to speak, that will differ in the case of each individual defendant, and we in our capacity of Defense Counsel will have to agree which expert will cover the largest territory on the strength of hid knowledge so that we do not produce large numbers of experts here. Many experts today are not allowed to practice since they no longer hold their professorships of are not appointed by a university. Others are busy and can not get away, and it will be necessary to do and see them and ask them if they are able and willing to appear. THE TRIBUNAL (Judge Sebring): I do not believe you understood my question. You are proposing to call experts in what field, the field of medicine and research? MR. SERVATIUS: Yes, that is right. THE TRIBUNAL (Judge Sebring): Do you know where potential expert witnesses are living or residing? Do you have that information. MR. SERVATIUS: I have not dealt with that problem myself. My colleague, Dr. Nelte, will probably be able to answer that question. 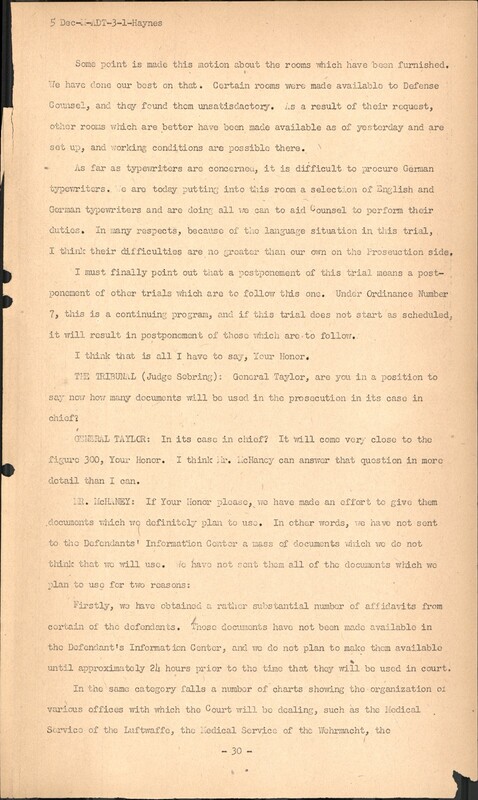 DR. NELTE: Gentlemen of the Tribunal, with reference to what my colleague, Dr. Servatius, has said I should like to add the following, and else as a reply to what has been said earlier, namely, that the difficulties we had were of a figurative nature and were not of a concrete nature. May I please point cut to you that on the 26th of November I had already submitted application, to which even today I am still without a reply. In that application, dated 26th of November, I had named six experts and witnesses who are of general and great importance to this trial. 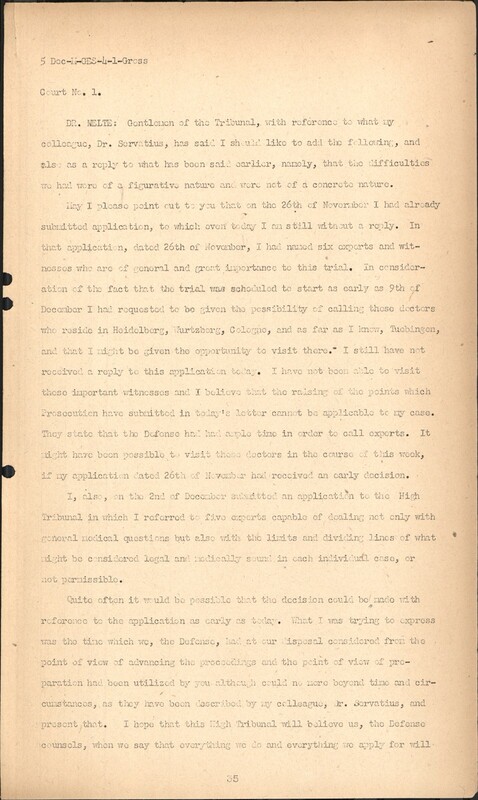 In consideration of the fact that the trial was scheduled to start as early as 9th of December I had requested to be given the possibility of calling these doctors who reside in Heidelberg, Wurtzberg, Cologne, and as far as I know, Tuebingen, and that I night be given the opportunity to visit there. I still have not received a reply to this application today. I have not been able to visit these important witnesses and I believe that the raising of the points which Prosecution have submitted in today's letter cannot be applicable to my case. They state that the Defense had ample time in order to call experts. It might have been possible to visit these doctors in the course of this week, if my application dated 26th of November had received an early decision. I, also, on the 2nd of December submitted an application to the High Tribunal in which I referred to five experts capable of dealing not only with general medical questions but also with the limits and dividing lines of what might be considered legal and medically sound in each individual case, or not permissible. Quite often it would be possible that the decision could be made with reference to the application as early as today. 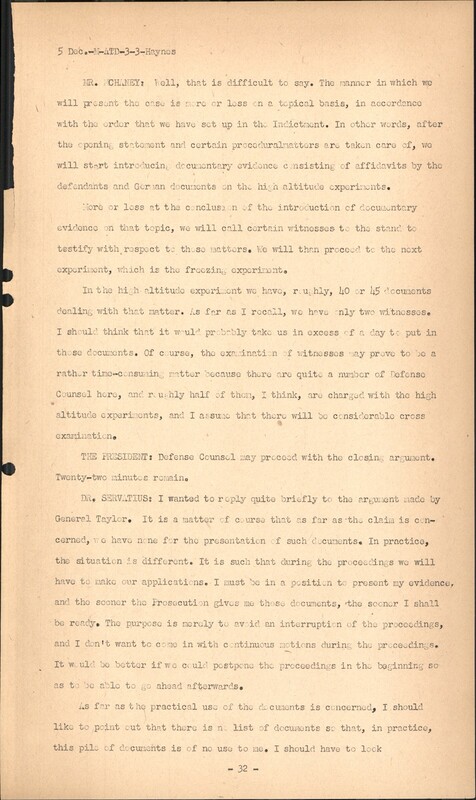 What I was trying to express was the time which we, the Defense, had at our disposal considered from the point of view of advancing the proceedings and the point of view of preparation had been utilized by you although could no more beyond time and circumstances, as they have been described by my colleague, Dr. Servatius, and present that. I hope that this High Tribunal will believe us, the Defense counsels, when we say that everything we do and everything we apply for will be raised in the connection that with it and through it we act in general best interest, not only of ourselves but the Tribunal and Prosecution, since it is our aim and our ambition to assist in the greatest possible clarification of the real circumstances and material throughout this case. 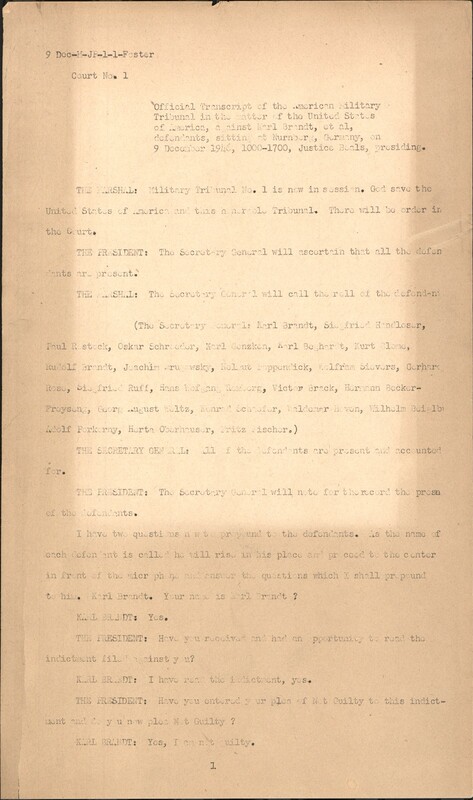 It is for that reason that the objection raised by the Prosecution, namely, that there is no legal regulation according to which the documents and any other material should be submitted in good time is not, I think, quite applicable in our case, because we, both the Prosecution as well as the Defense, have the mutual duty to contribute everything we can in order to elucidate and investigate the circumstances throughout and place at your disposition, your Honor, material as complete and as necessary to finding the truth. THE TRIBUNAL (Judge Beals): The Court has a question to propound upon the Prosecution. 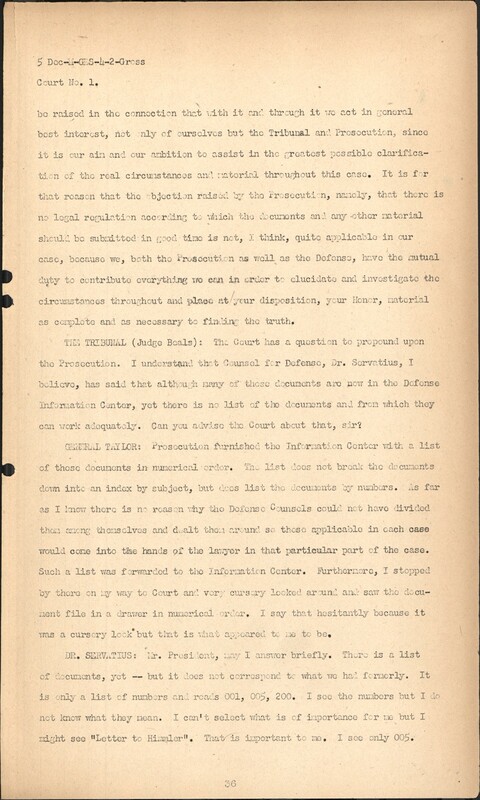 I understand that Counsel for Defense, Dr. Servatius, I believe, has said that although many of these documents are now in the Defense Information Center, yet there is no list of the documents and from which they can work adequately. Can you advise the Court about that, sir? GENERAL TAYLOR: Prosecution furnished the Information Center with a list of these documents in numerical order. The list does not break the documents down into an index by subject, but does list the documents by numbers. As far as I know there is no reason why the Defense Counsels could not have divided them among themselves and dealt them around so those applicable in each case would come into the hands of the lawyer in that particular part of the case. Such a list was forwarded to the Information Center. Furthermore, I stopped by there on my way to Court and very cursory locked around and saw the document file in a drawer in numerical order. I say that hesitantly because it was a cursory lock but that is what appeared to me to be. DR. SERVATIUS: Mr. President, may I answer briefly. 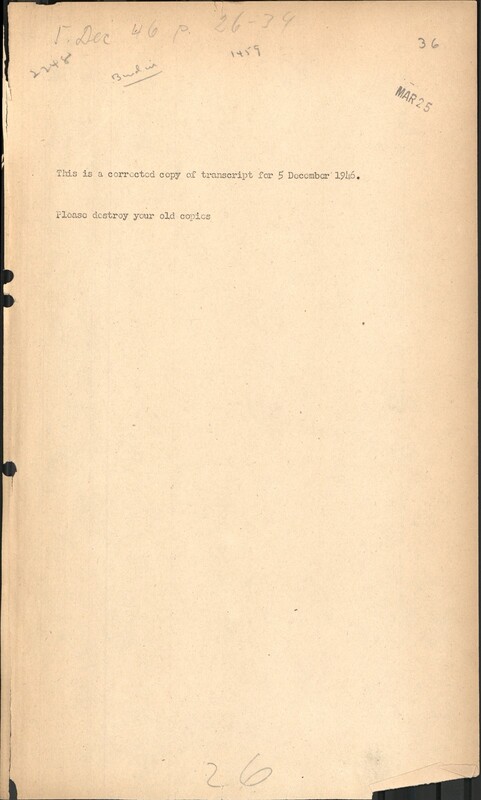 There is a list of documents, yet -- but it does not correspond to what we had formerly. It is only a list of numbers and reads 001, 005, 200. I see the numbers but I do not know what they mean. I can't select what is of importance for me but I might see "Letter to Himmler". That is important to me. I see only 005. I can't see that on the documents. A list of numbers is useless to me. It is only of use to the person in charge of the documents as he knows which documents are there. I cannot exchange with my colleagues because I do not know who has the important documents. 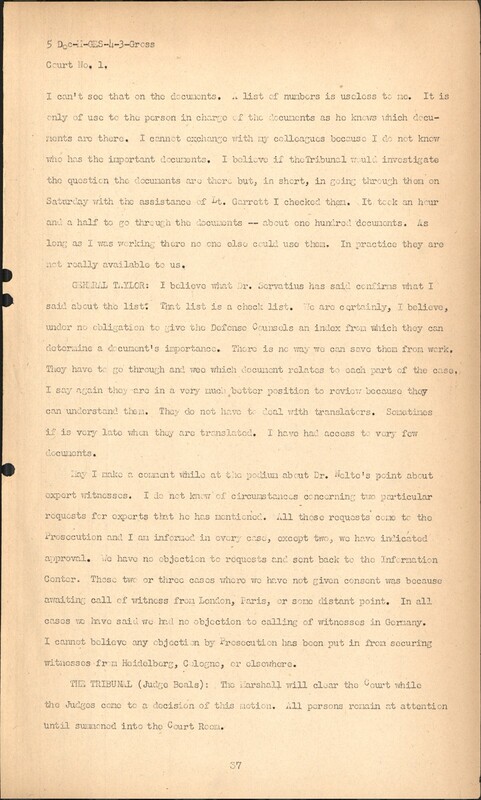 I believe if the Tribunal would investigate the question the documents are there but, in short, in going through them on Saturday with the assistance of Lt. Garrett I checked them. It took an hour and a half to go through the documents -- about one hundred documents. As long as I was working there no one else could use them. In practice they are not really available to us. 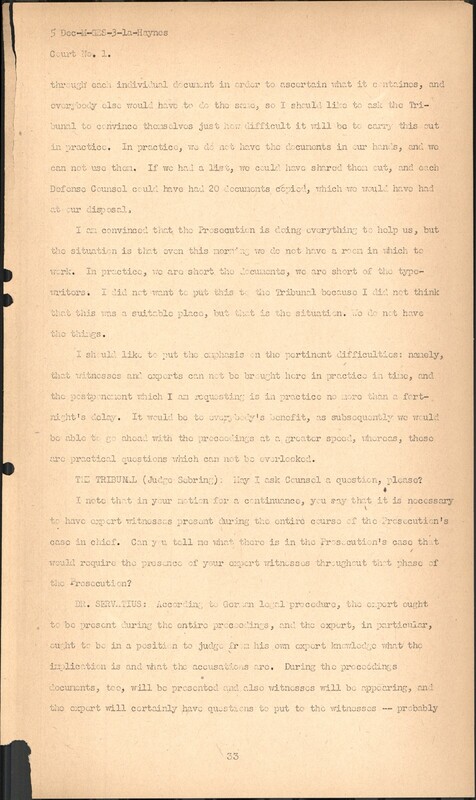 GENERAL TAYLOR: I believe what Dr. Servatius has said confirms what I said about the list: That list is a check list. We are certainly, I believe, under no obligation to give the Defense Counsels an index from which they can determine a document's importance. There is no way we can save them from work. They have to go through and we which document relates to each part of the case. I say again they are in a very much better position to review because they can understand them. They do not have to deal with translators. Sometimes if is very late when they are translated. I have had access to very few documents. May I make a comment while at the podium about Dr. Nelte's point about expert witnesses. I do not know of circumstances concerning two particular requests for experts that he has mentioned. All those requests come to the Prosecution and I am informed in every case, except two, we have indicated approval. We have no objection to requests and sent back to the Information Center. Those two or three cases where we have not given consent was because awaiting call of witness from London, Paris, or some distant point. In all cases we have said we had no objection to calling of witnesses in Germany. I cannot believe any objection by Prosecution has been put in from securing witnesses from Heidelberg, Cologne, or elsewhere. THE TRIBUNAL (Judge Beals): The Marshall will clear the Court while the Judges come to a decision of this motion. All persons remain at attention until summoned into the Court Room. THE PRESIDENT: The court has considered the briefs filed in connection with this matter and the argument of counsel; the Tribunal rules that the motion for a continuance will be denied without prejudice, however, to the rights of the defendants to present any appropriate motions during the course of the trial for any necessary reasonable recess, either to secure expert witnesses or consultants to be present during the course of the Prosecution's case in chief; or to secure other witnesses or documents. The Tribunal will attempt to dispose of all motions or applications for the presence of witnesses or production of documents no later than tomorrow. Will the counsel for the Prosecution step to the podium? 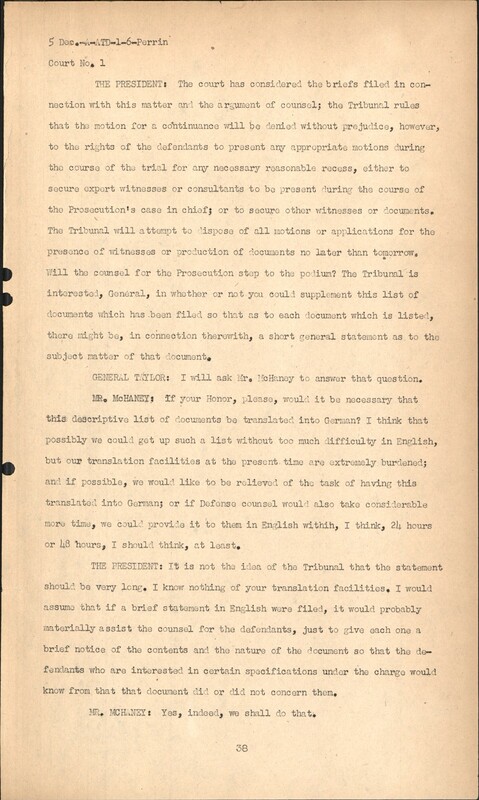 The Tribunal is interested, General, in whether or not you could supplement this list of documents which has been filed so that as to each document which is listed, there might be, in connection therewith, a short general statement as to the subject matter of that document. GENERAL TAYLOR: I will ask Mr. McHaney to answer that question. 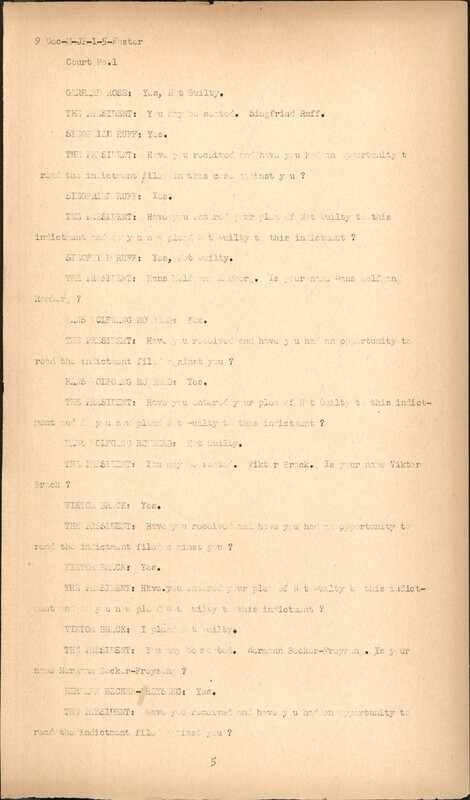 MR. McHANEY: If your Honor, please, would it be necessary that this descriptive list of documents be translated into German? 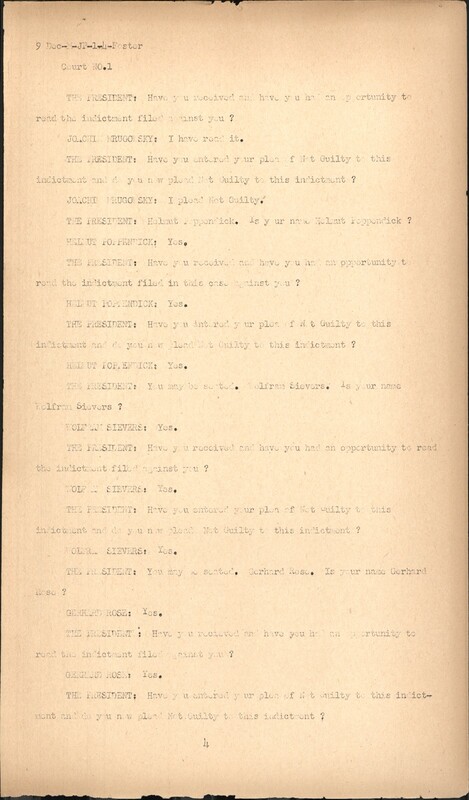 I think that possibly we could get up such a list without too much difficulty in English, but our translation facilities at the present time are extremely burdened; and if possible, we would like to be relieved of the task of having this translated into German; or if Defense counsel would also take considerable more time, we could provide it to them in English within, I think, 24 hours or 48 hours, I should think, at least. THE PRESIDENT: It is not the idea of the Tribunal that the statement should be very long. I know nothing of your translation facilities. 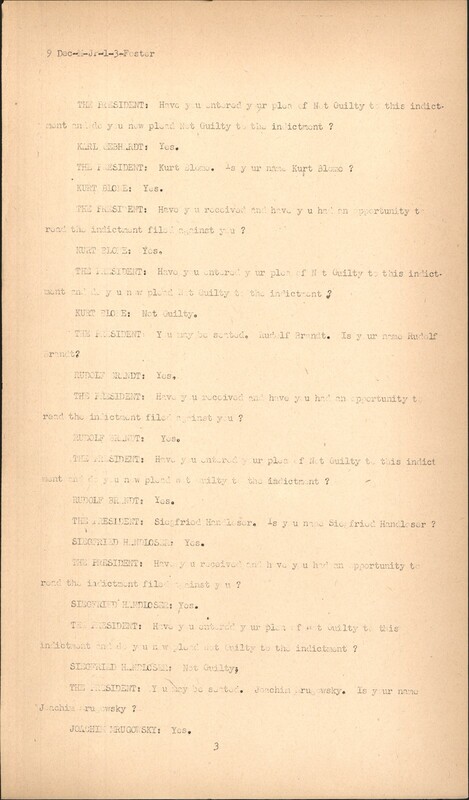 I would assume that if a brief statement in English were filed, it would probably materially assist the counsel for the defendants, just to give each one a brief notice of the contents and the nature of the document so that the defendants who are interested in certain specifications under the charge would know from that that document did or did not concern them. MR. MCHANEY: Yes, indeed, we shall do that. JUDGE BEALS: I would like to ask Defense Counsel a question. Do you think, Counsel, that the filing of a brief statement in English would be of material assistance to you and would be sufficient until possibly a German translation could be provided? DR. SERVATIUS: It would be of great assistance to us. If a number of Defense Counsel have difficulties, we would be able to help each other. We would be very glad to get it soon. May I ask about the number of documents, if we could have twenty-three lists, one for each defendant? There are twenty-three defendants, if we could have twenty-three copies. JUDGE BEALS: I would ask Counsel for the Prosecution to furnish that if possible. You are excused. JUDGE SEBRING: General Taylor, is it mechanically possible to do that? GENERAL TAYLOR: Yes, Your Honor, I believe it would be by stenciling it. JUDGE SEBRING: Within what period of time? GENERAL TAYLOR: Well, we will do our best to have it in within twenty-four hours. Until I check with the clerical facilities I am a little reluctant to say definitely that we can do it in twenty-four hours, but we will shoot for that and I think we will certainly be able to have it in forty-eight. JUDGE BEALS: This informal session of the Tribunal will now adjourn. 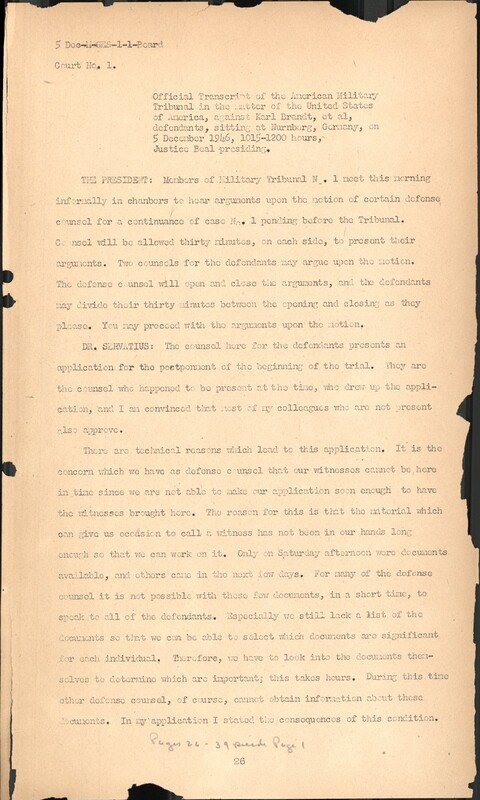 Official Transcript of the American Military Tribunal in the matter of the United States of America, against Karl Brandt, et al, defendants, sitting at Nurnberg, Germany, on 9 December 1946, 1000-1700, Justice Beals, presiding. THE MARSHAL: Military Tribunal No. 1 is now in session. God save the United States of America and this honorable Tribunal. There will be order in the Court. THE PRESIDENT: The Secretary General will ascertain that all the defendants are present. THE MARSHAL: The Secretary General will call the roll of the defendant. THE SECRETARY GENERAL: All of the defendants are present and accounted for. THE PRESIDENT: The Secretary General will note for the record the prose of the defendants. I have two questions now to propound to the defendants. As the name of each defendant is called he will rise in his place and proceed to the center in front of the microphone and answer the questions which I shall propound to him. Karl Brandt. Your name is Karl Brandt? THE PRESIDENT: Have you received and had an opportunity to read the indictment filed against you? KARL BRANDT: I have read the indictment, yes. THE PRESIDENT: Have you entered your plea of Not Guilty to this indictment and do you now plead Not Guilty? KARL BRANDT: Yes, I am not guilty. THE PRESIDENT: You may be seated. Paul Rostock. THE PRESIDENT: Have you received and have you had an opportunity to read the indictment filed against you? THE PRESIDENT: Have you entered your plea of Not Guilty and do you now plead not Guilty to the indictment? PAUL ROSTOCK: I am Not Guilty. THE PRESIDENT: You may be seated. Oskar Schroeder. THE PRESIDENT: You may be seated. Karl Genzken. Is your name Karl Genzken? THE PRESIDENT: Have you entered your plea of Not Guilty to this indictment and do you now plea Not Guilty to the indictment? THE PRESIDENT: You may be seated. Karl Gebhardt. Is your name Karl Gebhardt? THE PRESIDENT: Have you entered your plea of Not Guilty to his indictment and do you now plead Not Guilty to the indictment? THE PRESIDENT: Kurt Blome. Is your name Kurt Blome? THE PRESIDENT: Have you entered your plea of Not Guilty to this indictment and do you now plead Not Guilty to the indictment? THE PRESIDENT: You may be seated. Rudolf Brandt. Is your name Rudolf Brandt? THE PRESIDENT: Siegfried Handloser. Is your name Siegfried Handloser? THE PRESIDENT: You may be seated. Joachim Mrugowsky. Is you name Joachim Mrugowsky? JOACHIM MRUGOWSKY: I have read it. THE PRESIDENT: Have you entered your plea of Not Guilty to this indictment and do you now plead Not Guilty to this indictment? JOACHIM MRUGOWSKY: I plead Not Guilty. THE PRESIDENT: Helmut Poppendick. Is your name Helmut Poppendick? THE PRESIDENT: Have you received and have you had an opportunity to read the indictment filed in this case against you? THE PRESIDENT: You may be seated. Wolfram Sievers. Is your name Wolfram Sievers? THE PRESIDENT: You may seated. Gerhard Rose. Is your name Gerhard Rose? GERHARD ROSE: Yes, Not Guilty. THE PRESIDENT: You may be seated. Siegfried Ruff. SIEGFRIED RUFF: Yes, Not Guilty. THE PRESIDENT: Hans Wolfgang Romberg. Is your name Hans Wolfgang Romberg? HANS WOLFGANG ROMBERG: Not Guilty. THE PRESIDENT: You may be seated. Viktor Brack. Is your name Viktor Brack? VIKTOR BRACK: I plead Not Guilty. THE PRESIDENT: You may be seated. Hermann Becker-Freyseng. Is your name Hermann Becker-Freyseng?